If you haven’t enjoyed a beer from the Odin Brewery, you might be forgiven since they closed down in 1988. But until then, the brewery was actually Denmark’s oldest. But recently, during the renovation of a building in Viborg, construction workers discovered seven unopened, 113-year-old bottles of beer from Odin Brewery under some old floorboards. “The bottles are in exquisite condition with corks and labels intact. It looks like an entire palette of beer from back then. We have bottles from the Odin Brewery at the museum, but none with any content. I’ve spoken with beer experts who estimate that Odin beer from 1906 is very rare,” Dan Ersted Møller, a curator from Viborg Museum, told DR Nyheder. Aside from the beers, the construction workers also found a handwritten note written by the head brewer of Odin at the time, CE Pehrsson. In 2008 a similar find occurred in an old basement under the Carlsberg City. Bottles from 1883 were discovered and Carlsberg managed to recreate the beer from back then using viable yeast cells. Perhaps that same technique could be used for the Odin beers. “It could be fun to know how a Viborg beer tasted back in 1906. Odin is a big part of Viborg’s history. Finding these beers is a fantastic element that shouldn’t be dismissed,” said Møller. 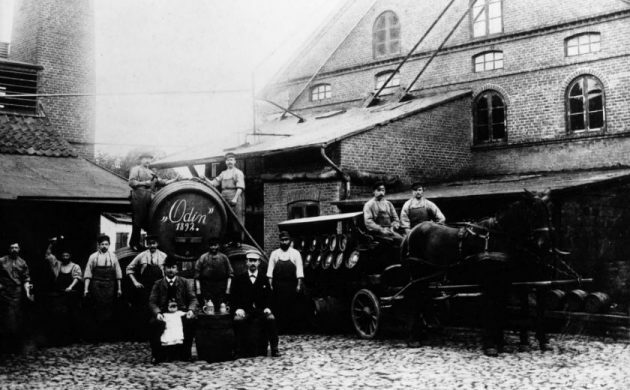 The Odin Brewery was founded back in 1832 and was located on Store Sct Mikkels Gade 7 in Viborg. In 1978 the brewery was bought by Faxe Brewery and the beer was discontinued a decade later in 1988 after 156 years of operations. Among the most popular brands were Prinsens Bryg, Odin Pilsner and Viborg Pilsner.